The Evaluating the Effectiveness of Fuel Treatments in Alaska project was funded by the Joint Fire Science Program (Project 14-5-01-27). 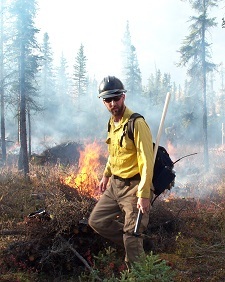 The project was designed to assess the effectiveness of maturing treatment projects in terms of previously defined risk reduction and fire behavior objectives in order to better understand the contribution of fuel treatments to the broader economics of wildfire management in Alaska. Along with contributing to our knowledge on the ecological maturation of existing fuel treatments we also examined what influence publicly funded fuel treatments had on wildland fire suppression costs in Alaska, whether suppression resource ordering is affected by the presence of a fuel treatment, and what role fuel treatments play in encouraging homeowners in WUI locations to reduce wildfire risk on their property. The study assessed operational and demonstration fuel breaks which were installed between 2001 and 2009. In brief, investigators found that fuel treatments in boreal black spruce induced surface layer species composition changes due to moss die-off without exposure of mineral soil, and to destabilization of soils and melting of frozen layers. Modeled fire behavior at the selected sites (BEHAVE 6.0) mostly indicate that shaded fuel breaks still retain most benefits of reduced fire behavior potential (due to the reduction of canopy density and ladder fuels) for at least 14 years. Findings from a discrete choice experiment suggest that responding homeowners were more willing to incur the additional costs associated with private wildfire risk mitigation when a thinned/shaded fuel treatment was present on nearby public lands. Little et al., 2018. Final Report: Evaluating the Effectiveness of Fuel Treatments in Alaska, JFSP Project 14-5-01-27. 52 pp + 45 pp appendices. 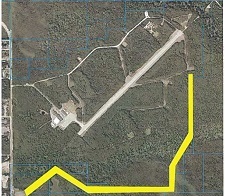 Forest Treatments to Reduce Fire Hazard in Alaska: A compilation of case studies: this product presents all of this project’s study areas as case studies with photos and the individualized results. Facts from Flames. 2016. An article from Aurora magazine by Sam Bishop about the results from the fuel treatment and Nenana Ridge projects. For more information or resources, contact AFSC coordinator Alison York, ayork@alaska.edu, 907-474-6964 or Randi Jandt, rjandt@alaska.edu.